Emeraz – The Next Big Thing Officially Launches! We’ve received word today that the previously reported on Emeraz has now officially launched – the most complete web-platform for musicians that we think we’ve ever seen. Enabling users to search, connect and collaborate with other musicians – receive critical feedback on their music from industry insiders and submit songs for consideration by artists such as The Saturdays and Julian Marley. Emeraz, the website that caters for music creators and music industry professionals has now gone live. This new network aims to provide emerging artists with all the tools they need to gain a foothold in the music industry as well as allowing industry professionals access to untapped talent. Membership of Emeraz will allow a musician to establish an online creative identity. In addition to being a member of a large network of music creators from around the world, Emeraz allows its users to easily copyright and sell songs through the website. Their songs can also be evaluated by fellow members and those receiving enough engagement will be showcased on the sites soon to be installed Trending Wall. Songwriters can also now pitch songs to established artists. Acts as diverse as Julian Marley and The Saturdays are currently seeking new material through Emeraz. 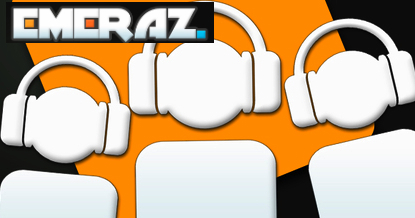 From a record industry perspective, Emeraz will aid in the quick identification of talent. It will also provide up to the minute analytics of how a particular artist is doing both in terms of sales and popularity. “Emeraz is getting it right by giving musicians, songwriters and people in the music business a place to connect and work together online. It is the modern approach.” – Pelle Lidell, European A&R Executive, Universal Music Publishing. Emeraz aims to be the one stop shop for budding musicians and those wishing to discover them. With an ever expanding membership and some key support from established acts and record labels this aim is looking ever more plausible.